(Scott Sommerdorf | The Salt Lake Tribune) Utah Jazz forward Jae Crowder (99) looks back to see Houston Rockets guard Eric Gordon (10) make a reverse layup during first half play. The Houston Rockets led the Utah Jazz 70-40 at the half of game 3, Friday, May 4, 2018. 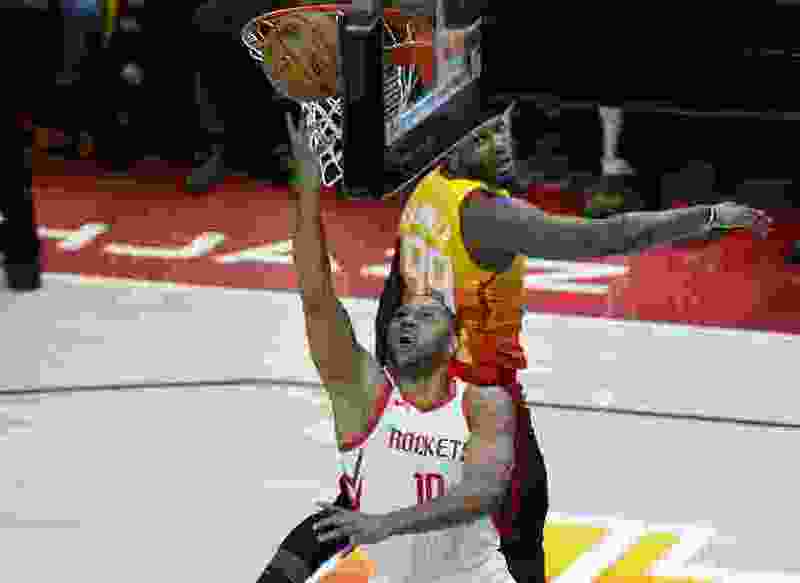 James Harden and Chris Paul finished with their usual impressive statistical performances for the Houston Rockets in Friday night’s Game 3 win over the Utah Jazz, but Eric Gordon was a difference-maker. Gordon scored 25 points on 8 of 13 shooting off the bench, assuring the Rockets of maintaining an unrelenting level of offensive firepower on the court as they torched one of the NBA’s best defensive teams for 113 points, including a 70-point first half, in an eventual 113-92 win at Vivint Smart Home Arena. Gordon, the NBA’s 2016-17 Sixth Man of the Year, scored 17 first-half points — two more than he had in Game 2 in Houston when he went a dreadful 5-for-16 from the floor. “I just wanted to be aggressive tonight and always be in attack mode and knock down shots,” Gordon said. Gordon, who averaged 18 points per game during the regular season, recorded his first 20-point game of the postseason and his highest-scoring game since he scored 31 against the Chicago Bulls on March 27. Gordon wasn’t the only non-headliner for the Rockets who made his presence felt after a lackluster performance in a Game 2 loss. Trevor Ariza’s 11 points marked his highest-scoring night of the series, and he was an efficient 4 of 8 shooting, one game after scoring five points total.